In 1995 my wife gave me my 1st bible, a Charles Swindoll “Living Insights” Study bible in the NIV translation. I can recall reading in my early Christian life, and most of what the bible contained did not make sense to me. Still, there were truths contained inside that I just believed to be fact. Some verses brought more questions than answers at times. I remember asking someone where do I start? The book of John. I remember reading about Jesus and trying to make sense of the parables but did not. I tried to read the Old Testament but just could not get past Genesis. My bible stayed relatively new for the next 14 years because it stayed closed most of that time. In 2008 I fully surrendered my life to the Lord, and I opened my bible again. I was hungry for the Word, and I spent most of my days reading, studying and learning. 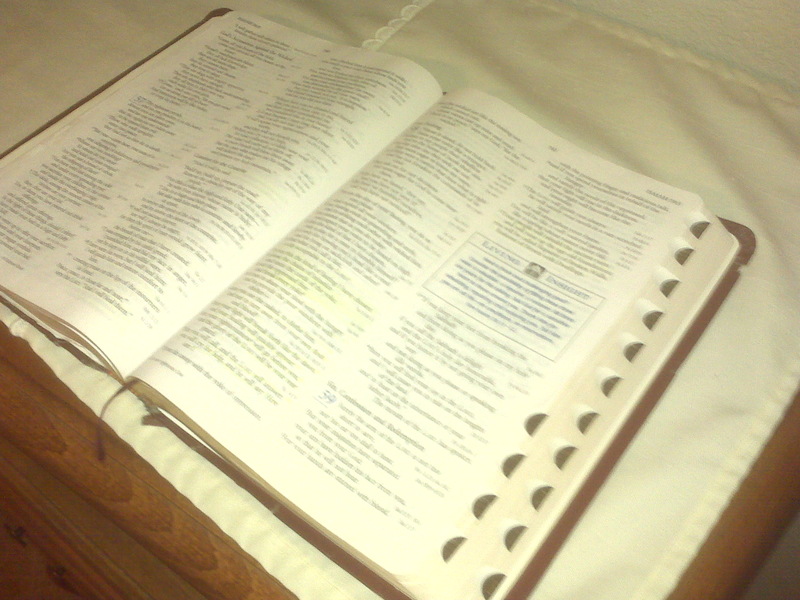 I began to cherish my bible, and take it with me everywhere I went. Since then I have managed to read about 75 % of the bible including all of the New Testament. Verses that were went over my head began to make sense, and the Holy Spirit began to illuminate verses I had read before. Now 15 years later my bible is starting to fall apart on the outside so I don’t carry with me as much as I used to even though the pages have held very well. I thought about having it rebound but there is something about it’s worn look that I like. It makes me think of myself. 15 years later I am worn on the outside but “new” on the inside. I absolutely love my bible, and thank God for the woman both who both led me to Christ, and gave it to me. As I enter a new season in my walk with the Lord I have started looking for my next Bible. I was searching Christianbook.com and was amazed to see how many there are, how many translations, bindings and purposes. After coming across the Bible Design Blog I was fascinated to learn about the high quality bibles that are available. After reading several translations, and looking at the page layouts I have decided to get the ESV Single Column Reference Bible by Crossway Books and Bibles. Is is a wide-margin single column, verse-by-verse layout with each verse starting on its own line rather than the usual paragraph format. There are still a couple of study bibles I would love to have such as the ESV Study Bible and the NASB Hebrew/Greek Key Word Study Bible to help me study and learn. 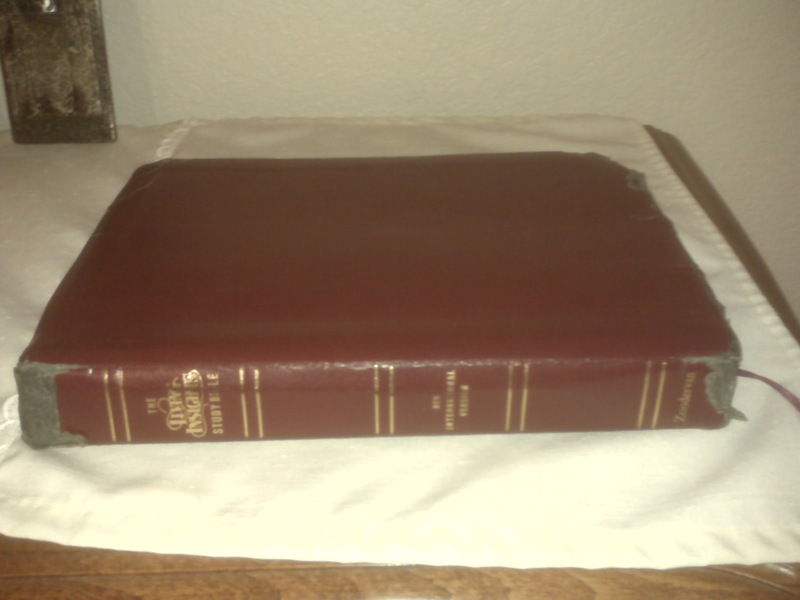 I believe the ESV SCR bible is the one I will use, learn, and grow old with. More importantly, I pray that I can teach others so they can have a better understanding of God’s beautiful Word. I would love to hear your bible stories or comments. This entry was tagged bibles, christianity, Crossway, ESV, God, Living Insights, NASB, New Testament, NIV, Old Testament, The Word. Bookmark the permalink.